Don't break the bank! Follow our guide to all things financially savvy. Many public spaces, like parks or the local village green, may be available to rent at a low fee. However, if the space is not equipped to handle events, you’ll have to rent everything from napkins to tables and chairs. Check out our complete guide to wedding rentals, and make sure you come out ahead! Choose an unusual venue, such as an aquarium, a zoo, a gallery or an historical site. Site fees are not high and you’ll save on décor because the venue already supplies ambience. But the same caveat goes as for public spaces: Figure in what you’ll have to spend on rentals. 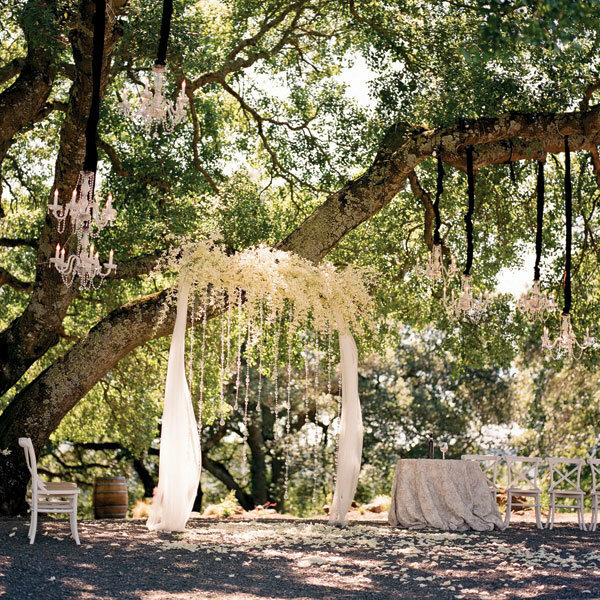 Depending on your venue, you may not need to decorate extensively. If you marry outdoors at a winery, for example, there’s not much you’ll need to add to the gorgeous vineyard backdrop. If you’re a city-dweller, leave town for your wedding. One Boston bride saved more than $50 per person by holding her wedding in Burlington, Vermont. What about a destination wedding? Because the guest list will be smaller, a wedding away may cost less than a traditional event held in your hometown. Think small. Check into bed and breakfast venues in your area, and place firm limits on your guest list. When you’re deciding between an indoor or outdoor space, figure in the cost of a tent rental — if it rains, a tent is worth every penny. Accept a post-wedding brunch at a relative’s home as a wedding gift. You may find that in lieu of a gift, a friend or relative will be thrilled to host this event in their home. Have a lunch or an afternoon tea reception instead of a sit-down dinner. Guests tend to drink less during the day, so you’ll save on liquor costs. Another increasingly popular choice is the cocktail party reception. Event planner Harriette Rose Katz notes that you’ll save thousands on food and decorations; after all, you can forgo big floral arrangements for your tables and adorn small cocktail tables with candles and modest bunches of blooms. Hand pass hors d’oeuvres like mini hot dogs, grilled cheese sandwiches and mini quiches. On a multi-tiered table offer finger foods like Italian breads, olives, artichoke hearts and cheeses (at room temperature), finger fruits and salads. Consider a chic wine-tasting reception. Guests can sample from an array of small dishes at food stations, each matched with a special wine. Printed cards can explain the pairing. For savings of up to 20 percent, consider family-style dishes: platters of pasta or sliced meat that guests can pass around. Buy flowers wholesale in a local market or online, and pay a florist to do simple centerpieces. Want to keep things really easy? Do one look in abundance and make an impact. Place tons of branches, like curly willow or dogwood, in urns or tall glass vases from the dollar store; for a bit more flair, hang LED tealights from them with ribbons in your wedding colors. Sure, peonies may be your favorite flower, but if you’re tying the knot in winter, these springtime beauties will cost you a pretty penny. A good florist should be able to suggest in-season blooms that get the look and feel of your out-of-season favorites. Be sure to check out our guide on what will be in season at the time of your wedding. Be sure to use all kinds of candles to good advantage: Place votives, pillar candles or tapers between floral arrangements and create a stylish look on a shoestring. Must you place flowers on tables? Of course not. Pick one focal point — perhaps the entrance or the front corners of the room — and place just one gorgeous arrangement there. Forgo expensive silver vases in favor of clear glass. Or shop local flea markets for vintage containers of different but complementary designs for your table — you’ll achieve a unique look at small cost. Cut out the bubbly; guests can toast with whatever they’re drinking. Forget the full bar. Instead, serve beer and wine (both red and white) with one or two signature cocktails that you’ve personalized with a cute name and your wedding colors. If you happen to be holding your event near a vineyard or microbrewery, buy your wines and beers from them. Keeping to local products gives a special touch (and it’s cheaper). Don’t forget to have some inexpensive (nonalcoholic) drinks on hand. Consider fresh lemonade in tall, sugar-rimmed glasses for a warm-weather wedding or sparkling water with colorful wedges of orange, lemon or lime. For an added festive touch, dress up your signature drinks with colorful, attractive garnishes, like curled lemon and lime peels, orange slices or mini fruit kebabs on toothpicks. Garnishes are usually provided free of charge by the venue or caterer, but give the appearance that you’ve spent more. Eliminate shots or any drinks that make use of a number of liquors — these all raise your bar tab and aren’t necessary for guests to have fun. If you’re stocking your own bar, do your homework! Check winespectator.com for less-expensive wine vintages. Corkage fees (a charge for opening bottles of wine or liquor) may be up to $10 a bottle or even more. Try to negotiate these out of your contract. Close the open bar an hour early and offer coffee. You’ll save hundreds of dollars; even better, guests will have a chance to sober up before they head out to the road. Speaking of coffee, forgo a coffee bar offering expensive liqueurs with java and treat guests to a rich brew with flavored syrups. Or serve espresso before sending them home. If you, your fiancé or your friends are DIY-ers, consider creating your own invites by hand or high-quality printer. Your crafts store will have invitation and program kits — you can really get some unique effects this way! Don’t pay extra to have your invitations assembled; just get the bridal party together and set up an assembly line. If you have a friend who happens to be a terrific calligrapher, have her address your invitations as her gift to you — rather than paying someone else to do so. Calligraphic fonts that look like the real thing are readily available. Free font sources: searchfreefonts.com, highfonts.com, and dafont.com. Order your thank-you notes when you order your invitations. Some stationers give bulk discounts. Instead of renting a limo, go with a less costly option like a party van from a local car rental company. Whether you decide to book a limo or a van or any other sort of transportation, do this at least six months in advance of the wedding in order to get the best deal. Remember that white limos will always cost you more than black or silver ones. Don’t have the car that brings you to the ceremony wait for you all day — hourly rates will add up quickly. Have a different car pick you up later, after the reception. Photography is no place to skimp — your photos are the tangible mementoes of your wedding day — but if you do know someone who is just getting started, you may get a more affordable deal. A caveat: Make sure the work is top quality. Ask for references from former brides and grooms who have used the pro’s services. If a photographer you love is out of range of your budget, find out if you can wait till after the wedding to order proofs or albums. That way, you can put some of your gift money to good use. The most surefire way of finding a photographer and videographer who are right for you is to get recommendations from friends and family. However, be sure to carefully consider the work of many pros before making a decision about whom to hire and always keep in mind that the most expensive choice is not necessarily the best. If you’re deciding whether to go with a five-piece band or a DJ, you'll save at least half by choosing the DJ. Or, why not be your own DJ? Download your favorite music and create playlists for the ceremony and the reception on your iPod. Hook it up to rented speakers and enjoy! Negotiate a deal that you like. The closer you are to the wedding date (six months or less), the likelier it is that the band leader will work on your terms. Find out if one or two musicians can perform for the ceremony or cocktail hour as well. If your band offers a singer who also plays an instrument, you’ll save money. And remember: You don’t need more than one of each instrument—one saxophone will do as well as two or three. 2. How about a pierogi bar? These potato-stuffed morsels of dough, served with cheddar cheese, goat cheese or spinach and a sauce, are a terrific variation on low-cost comfort food. 3. A perfect (and inexpensive) appetizer option for a cool-weather wedding: Serve miniature cups of soup, like clam chowder or acorn squash. In warm weather, consider mini cups of cold soup like gazpacho. 4. Crudités don’t actually have to be crude just because you’re on a budget! Serve artichoke hearts, broccoli florets and radishes cut in shapes—instead of carrot sticks and celery. 2. Comparison shop for cocktail-party seafood. Calamari and mussels are usually half the price of shrimp cocktail. Your caterer should be able to offer guidance about other lower-cost selections. 3. Two kinds of stations to skip: first, the raw bar, which will be over-the-top expensive; second: a carving station. Prime rib, ham and pork loin are too heavy — and costly — for cocktail hour fare. 4. Before deciding on a seafood entrée, find out from the caterer what will be in season at the time of your wedding—a seasonal choice will save you hundreds of dollars. Likewise for meat: Select one that will come at a reasonable cost when you’re tying the knot. 1. A sophisticated salad course — like spring greens — can offset a less-costly entrée. 2. Go for a rich look at a low cost: Caterers often suggest putting out lots of lush salads and grilled vegetables in unusual platters, like colorful bowls and big woks, for a great presentation. Also keep in mind that people eat with their eyes first, and if you display food beautifully — like small tapas-style plates — guests won’t notice or care if the fare is quite simple. 1. Presentation is key. A simple meal will seem special when you consider the visuals. Brightly hued vegetables on low-cost chicken can make all the difference. 2. Have your caterer patronize local farms for produce; it’s fresher, better-tasting and cost-effective. 3. After nibbling on appetizers, your guests will not need a five-course dinner. Three will do — salad, an entrée and dessert. 4. Serve a duet plate for every guest. For example, you might serve a plate of beef medallions and grilled shrimp or crab cakes. You’ll save on the amount of food you offer—and on costs. 5. Use a delicious sauce on a simple pasta or chicken dish to up the wow factor. Ask your caterer for low-cost recommendations. 6. Add interest to pasta — a good budget choice — by considering more unusual varieties, like mushroom ravioli or spinach and cheese tortellini. 7. Forgo the filet. Your caterer can show you price options for different cuts of lamb and pork as well as beef. Braised boneless short ribs are a great choice. 8. Consider a vegetarian entrée option. These are usually less expensive, and guests might appreciate it for the novelty! 9. For side dishes, consider risotto instead of potatoes for something inexpensive and a bit unusual. Go with fresh flowers. The amount of labor that goes into creating flowers out of sugar ups the price of the cake. Consider your humble local grocery store. One bride’s supermarket bakery made her an elegant confection, based on a magazine photo, for less than $200. If you like fruit fillings, think seasonal. Strawberries can cost three times as much when served out of season. If your baker charges more for multiple cake flavors, limit yourself to your favorite. Have a dessert buffet. Mini pastries and other tiny sweets are crowd-pleasers. Save money by having only a small cake for your cake cutting. The cheesecake option can be a boon because it costs less. Arrange the cheesecakes on pedestals of varying heights — it will resemble tiers — and offer sauces, such as chocolate and kiwi. Traditionally, couples save the cake’s top layer to share on their first anniversary. If you and your fiancé don’t think you’ll be ready to dig in, forgo the extra layer and save some dough.